A handheld blender, also referred to as stick blender, is one of the most widely used kitchen tools. However, there remain a lot of people who are unsure if they should invest in a handheld or counter top blender. In a nutshell, handheld blenders look like a small version of a hand mixer. It has a long stick-like shaft and a single rotating blade, unlike standard blenders which have two blades and use a bowl to belnd automatically. They usually incorporate a blade guard around the mixer to prevent injury. The shaft is usually made of plastic or stainless steel while the blades are made of steel. Because of its small size, it can be used to blend items within stock pots, jars or bowls. This makes it different from traditional blenders wherein you will have to combine all the ingredients in the mixing bowl. This is only one of the benefits of using a hand blender. In fact, handheld blenders have a variety of advantages making it popular among many industry professionals and consumers. Why Use a Hand Blender? A hand blender is a great kitchen tool to have particularly if you will be spending a lot of time in the kitchen trying a variety of different recipes. They come in many different models but what is important is that the hand blender you buy will meet essential requirements and will be able to perform tasks as necessary. Most handheld blenders are able to do basic mixing capabilities while others can do more because of its extra attachments. You may want to make sure that the handheld blender that you purchase is flexible enough to take care of different jobs required by your kitchen. Aside from that, it should also comfortably fit in your hand and it needs to have goodbalance to allow you to perform tasks without experiencing difficulty. Most hand blender models include 2 metal whisks which are designed to complete a variety of tasks such as whisking egg whites, mixing pudding, whipping cream and combining cake mixtures. It has been mentioned that handheld blenders can be used in making a variety of recipes such as soup, smoothies and baby food. It is very easy to make these with the use of a hand blender. You simply need to combine the necessary ingredients in a stockpot and insert the blade at one end of the blender. Next, turn on the blender by switching the button on the handle. You can start using it to blend or puree food in the same pot in which it is being cooked. It can be useful to get a hand blender with a longer shaft as it can be completely immersed without spraying food everywhere and making a mess in your kitchen. Because you will need to continually press the button to power the stick blender, you may want to make sure that the button of the blender can held down with ease. Convenience is another one of the advantages of hand blenders over standard models. Using this type of blender makes it unnecessary to transfer hot liquids from one container to another because you can use it directly on the pot. It also works quietly unlike counter top models. This makes it ideal for homes with small kids or pets as the noise will not scare them. Handheld blenders are also much easier to clean. You simply need to remove the blade to wash it and wipe the handle with a clean cloth. It is important to keep in mind that the blade should be unplugged before removing stuck food from the blade. 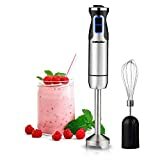 There are some handheld blenders that include additional accessories besides whisks such as chopping tools and a frother for coffee drinks. Most also come with a mixing bowl or jar which is handy particularly when you need to combine ingredients in a separate container. Hand blenders also feature variable speeds which can be used for different uses. Because a stick blender does not have the power to blend tough items such as ice, it would be better to use a traditional blender as a smaller model could be damaged. There are also handheld blender devices that include dough hooks which allow it to prepare bread dough, yeast dough as well as other similar mixtures. It would be much faster to knead doughs with the use of a hook and what’s great is that you would have the same quality as if it had been kneaded using your hands. There are models that allow you to extend the length of the blender to make it easier to blend and puree soups or sauces in deep stockpots. Investing in a good and reliable handheld blender will definitely make your life in the kitchen much simpler. For this Kitchen gadget Blender, you should know how to use it in perfect way. for this problem I am adding a link to that site which shows the video tutorial on how to use this gadget. I m sure this going to help people who dont have any skills.